Last night, 18/04/11 my workshop was broken into and many things were STOLEN, including a �6500.00 VaultBack! This guitar is an absolute one of a kind. It is the only one in the world! It shall be very easy to recognise, and therefore very hard to sell. If you have it and are reading this because you are researching the guitar, please return it, or have it handed into a police station. This instrument took me 3 months of hard labour to make. It has huge sentimental value. I am devastated. If you know of its whereabouts please contact the police immediately! 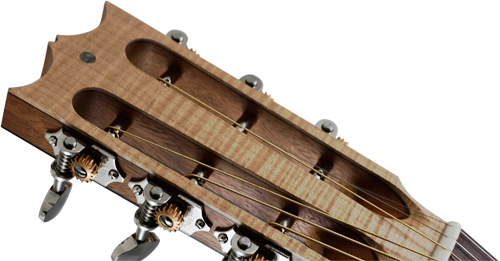 The guitar has a very distinctive arched back, made out of 2 woods, one blond maple, one red paduk. It also has a 3 piece neck of maple and paduk, and it has two roses inlayed on its front/top. The guitar was undergoing some repair work at the time so it is for sure that the thief shall require the hands of a luthier or good repair person to do this if they are to try and sell it. If you hear or know anything of this please contact the police. An image of one of the inlayed roses is attached. Other images in this gallery (link below) show other views of the guitar as well. Look for the red and blond one with the gloss finish. 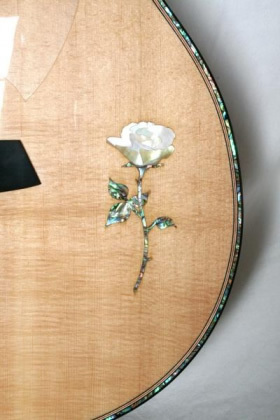 And the closed rose inlay. Please return it if you know of its whereabouts. It is very dear to me!